The Bannsiders are hoping to keep things in the family by luring Shiels back to Ballycastle Road. Shiels is understood to be one of the ‘Bannsiders’ main targets after his son-in-law, Kearney, left the Co. Derry club to take up full-time football with Scottish Premiership strugglers, St. Mirren, last weekend. 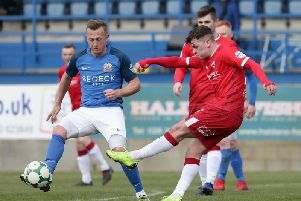 And with Coleraine considered serious contenders for the Danske Bank Premiership title after an excellent start to the season, the powers that be are believed to be considering a full time appointment. Shiels has another year of his contract to run in charge of the ‘Candy Stripes,’ but things have not gone according to plan during the current campaign with Derry having recently dropped into the bottom half of the League of Ireland’s 10 team top flight. Qualification for European football on an annual basis is a key element in the Brandywell club’s finances and on that front, Derry are struggling this year. In addition, the attendance figures on the Lone Moor Road have fallen well short of expectations given Derry’s newlook surroundings and poor league performances are an issue which is concerning the club’s Board of Directors. That said, Derry will play in the final of the EA Sports Cup on Sunday against First Division representatives, Cobh Ramblers and Shiels is also planning for a place in the FAI Cup semi-finals when facing Bohemians following the League Cup final. When contacted last night, Derry City refused to either confirm or deny that an approach had been made by Coleraine seeking permisson to speak to Shiels. It’s believed that Dungannon Swifts manager Rodney McAree, ex-Bannsiders and N Ireland skipper Steve Lomas and Institute boss Paddy McLaughlin have all been linked to the manager’s job, while Bannsiders chairman Trevor McKendry confirmed they have had number of enquiries from America, Iceland, France and England to fill the managerial position. “We will certainly move on and the decision won’t be taken lightly,” he stated. “The one thing I can tell you is that the backroom staff will remain the same and the structures won’t change. “The people who will help choose the next appointment will be the backroom staff, the Board of Directors, two independent personnel whom I trust enormously and senior pros at the club. “There’s a gut feeling about who we want to appoint and it was the same with Oran. “Oran arrived here to a club which wasn’t in a good situation, both on and off the pitch. “The club has now taken over the Academy, the turnover of the club has now developed into a big business and we need someone to come in with a business head on them and understand the implications of making wrong decisions.